Saratoga officials didn’t set an attendance goal for Saturday’s invasion by Curlin. But a projected crowd of 30,000 was bandied about in many corners, and 30,000 must have been the number intended. Well, only 22,572 people showed up. The shortfall was not NYRA’s fault. The track’s marketing team pulled out all stops. If John Sabini, the new chairman of the State’s Racing and Wagering Board, has a complaint, he had better add a few days to August. Four weeks is the natural length of the Saratoga season. The slogan, “The August Place to Be,” has become so imbedded in the local culture that the swirl of euphoria doesn’t begin until the month of July has ended. 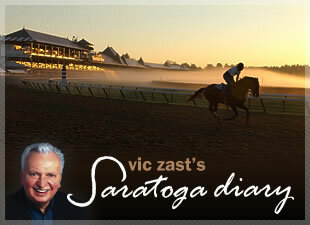 Labor Day weekend at the Spa is an ideal time and place for the $500,000 Woodward Stakes (gr. I), but Travers-sized crowds are out of the question. Martinez mans a tent on the midway leading up to the silks room. He’s on the right hand side, just before the horse path. Curlin came prancing down the path en route to the paddock surrounded by security men as if he was John McCain or Barack Obama. The closest horse to Curlin in the Woodward Stakes betting was the Metropolitan Handicap (gr. I) winner Divine Park and the horse furthest from Curlin in the betting was Past the Point. Wouldn’t you know it - Past the Point was the one that gave Curlin fits. In any case, despite a very slow closing quarter, Jess Jackson’s champion recorded his fifth grade I victory in his latest six outings. One loss, on the grass in the Man O’ War (gr. I) to Red Rocks, mars his recent record. Nobody remembered a time when so many curiosity-seekers had their appetites for star-gazing sated. The vast walking ring harbored at least a thousand people, all straining to see the classic chestnut. When Curlin took to walking the semi-circle, the first of many cheers gave notice to the moment. “Did it change my life to be at Saratoga when Curlin won the Woodward?” asked Janet Seeley of Orange, California, who then answered her own question with a no. “I’m 74 and this is the first big track that I’ve been to,” she added. “You knew from the beginning that he’d win by the way he looked,” said Marge Mei, Seeley’s host. Readers of this diary know that the horse with the inside post is the horse to bet in a 7-furlong dash. Therefore, rail sitter First Defence, Channing Hill in the irons, won the Forego (gr. I) for Bobby Frankel.